Co-developed a new firm practice area focused on innovation. Defined the company’s strategy for “impact labs,” built buy-in across the organization, and developed resources to train staff in our new approach. Served as an internal expert on design-thinking processes. 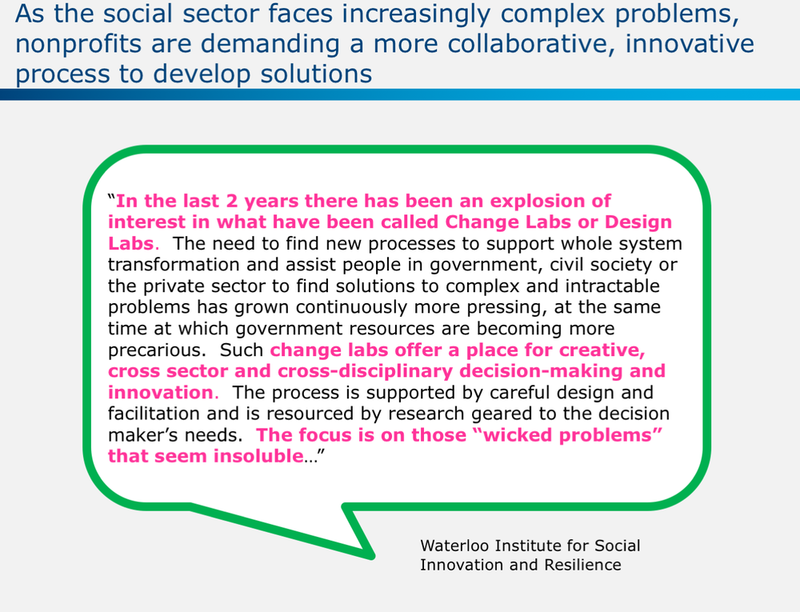 Designed and facilitated labs for social-sector clients. The Bridgespan Group, founded by Bain & Company in 2000, brings top-tier strategy consulting to the nonprofit world. The firm collaborates with mission-driven leaders, organizations, and philanthropists to help scale social impact and advance sector-wide learning. Bridgespan’s traditional consulting practice was modeled on Bain’s, using the same methodology, tools, and level of rigor to address problems. However, by 2012, it became apparent that Bridgespan needed to evolve its practice to better meet client needs. Bridgespan clients had begun asking for more collaborative, co-creative processes that would give them more ownership over the results of the work. Additionally, Bridgespan’s theory of change — a conceptual roadmap for how an organization expects to achieve its intended impact — had expanded to include a focus on systems and movements. Leaders within the organization were eager to incorporate new methods in meeting design, facilitation, and collaboration into the consulting practice. With this in mind, several case teams began testing an “innovation lab” approach, which was modeled on the work of design-thinking outfits like IDEO, frog, MIT Media Lab, and Reos Partners. While these ad hoc tests showed a deeper level of client engagement, instituting a more collaborative process would be a huge, creative shift for Bridgespan. 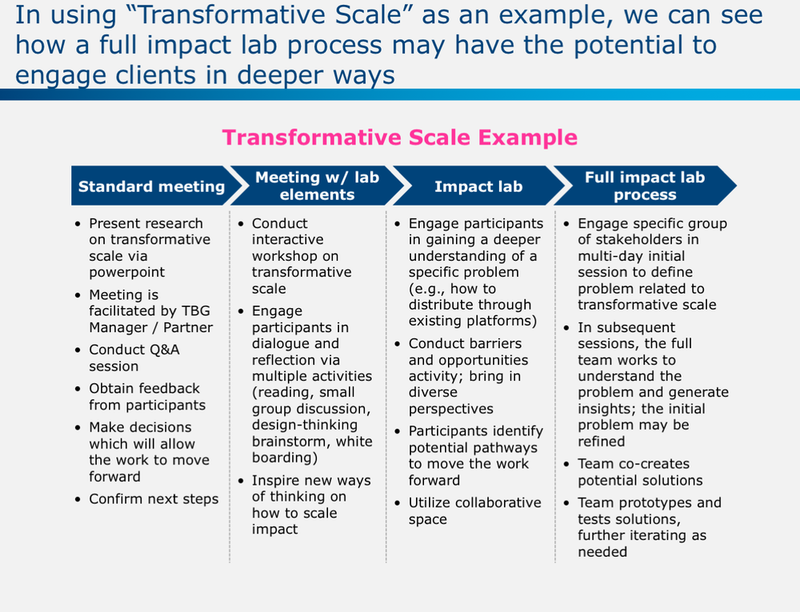 Over the span of two years, I acted as an internal advisor and co-led an initiative to build out our new impact lab practice. 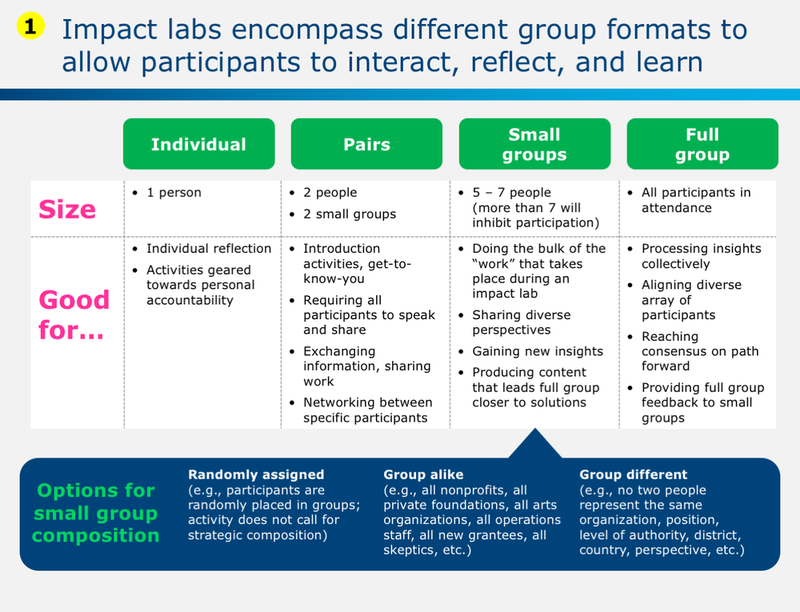 What is an impact lab? How do we define “impact labs” at Bridgespan? Is this only about meeting design and facilitation or something bigger? 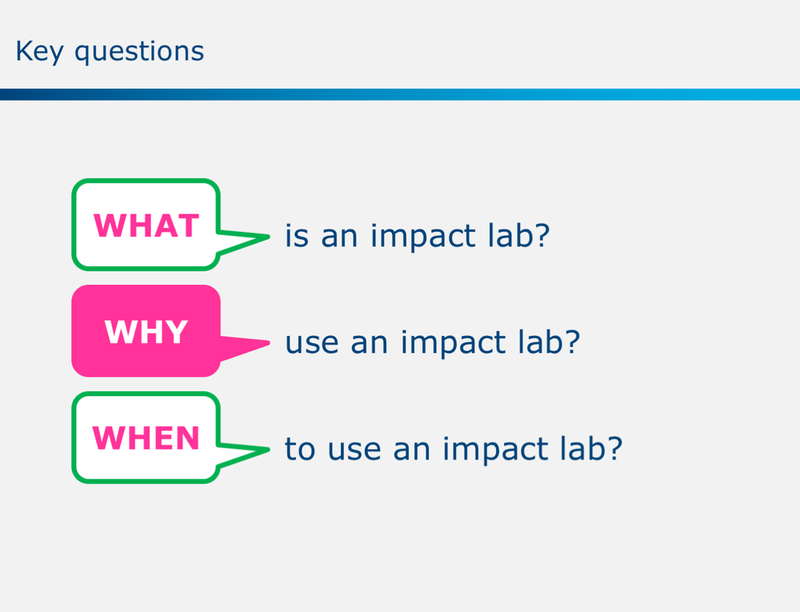 Why use an impact lab? What can a lab offer that traditional consulting can’t? When do we use an impact lab? How can we best integrate labs into our work with each other and our clients? Should we develop a menu of offerings or singular approach? How do we develop our internal capacity to do this type of work? How do we develop expertise and learn while doing? Working closely with my co-lead, we started by imagining our desired point of arrival. Success would involve transforming Bridgespan’s approach, shifting how we worked together to more fully incorporate the value of “collaboration” into our practice with each other and our clients. To achieve this, individuals and teams within Bridgespan would need to be sufficiently skilled in using a totally new methodology to address client needs. Practice heads and firm leadership would need to feel that Bridgespan could execute this well and set a new standard for both client engagements as well as Bridgespan-led social sector convenings. Each lab would need to feel extraordinary, effective, energizing, and impactful for our clients. In order to succeed, Bridgespan would need to learn by doing. Within our firm, we could experiment with new approaches to meeting and collaborating. To develop our long-term capacity to offer impact labs, we outlined three major phases of research and practice. 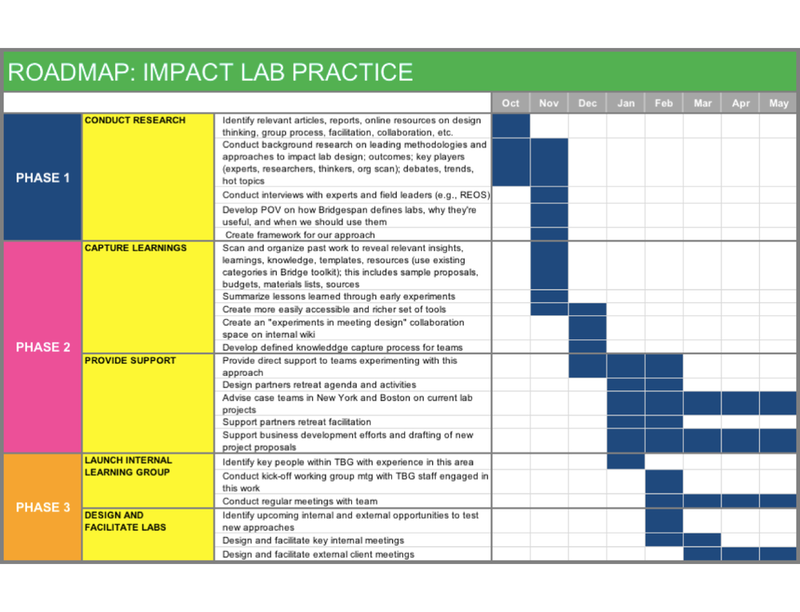 Develop how Bridgespan defines “impact labs.” Why are they useful and when should we use them? Create a framework that identifies different use cases for different types of meeting designs. Define lab requirements in terms of timelines, team structure, and costs. Conduct research on design thinking, group process, facilitation, and collaboration. Summarize lessons learned through early experiments in this work. 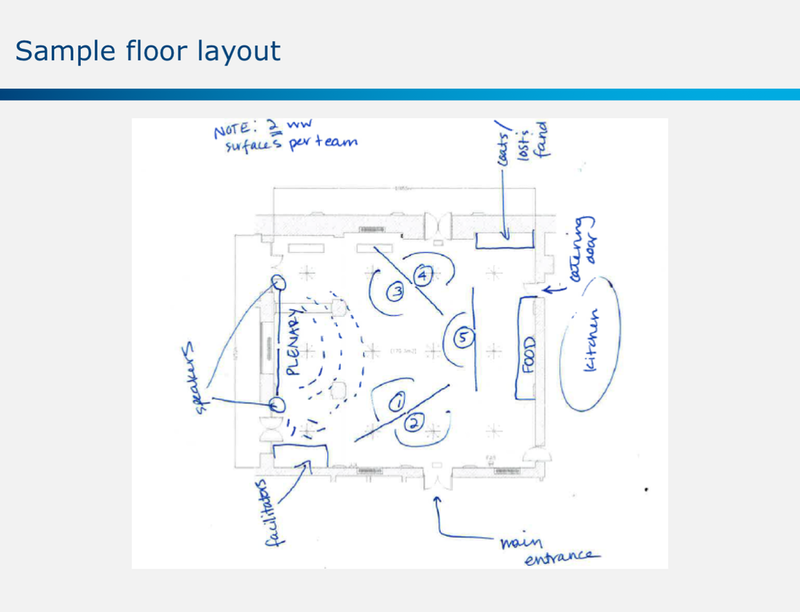 Create an “experiments in meeting design” collaboration space on our internal knowledge wiki. 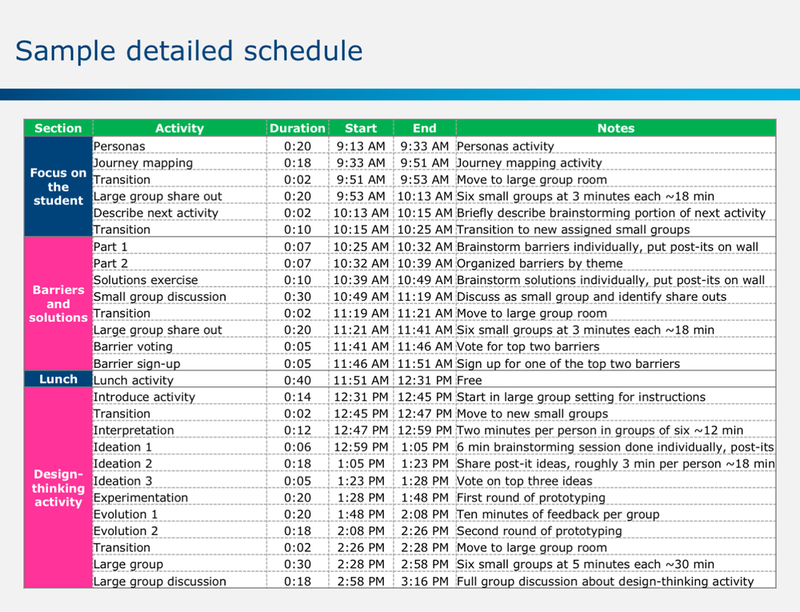 Create an easily accessible, rich set of tools for meeting designers and facilitators, including agendas, readings, and assignments. Develop a defined “knowledge capture process” for all teams that engage in our design lab experiments. Provide direct support to teams experimenting with this approach for internal projects and client-funded labs. Support business-development efforts and drafting of new project proposals. Identify individuals within Bridgespan with the desire, interest, and capacity to lead in this area. Launch an experiential learning program for select Bridgespan team members to become in-house “specialists” on impact labs. Design and facilitate key internal and external labs. Our first goal was to develop how Bridgespan might define “impact labs.” I led this work, assessing the broader innovation landscape and conducting research on design thinking. I looked into key methodologies, such as co-creation, as well as group processes and facilitation used by other organizations. Having previously worked with the Architects of Group Genius, a consulting practice dedicated to helping organizations solve complex problems through co-design, I spoke frequently with the practice’s founder to get his perspective on the field. Additionally, I reached out to my own network of colleagues, friends, and former collaborators at design and innovation firms, to get their input on the latest trends and methods. 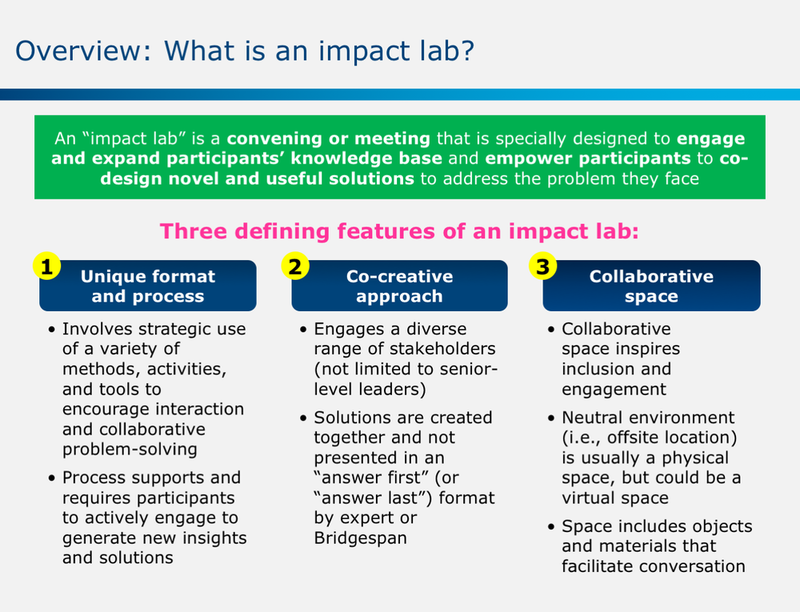 I also identified three main features of an impact lab: a unique format and process, co-creative approach, and space that inspires collaboration. I found that these elements provoked exploratory, generative thinking — known as the “ideation phase” of a lab. They also sparked discerning, convergent thinking, which was key for the selection and prototyping phases. With detailed agendas, involved facilitation, and frequent small group work, labs could empower participants to interact, reflect, and learn. Bridgespan’s traditional consulting model, based on Bain & Company’s “hypothesis first” methodology, was known for its rigor. Bridgespan’s partners and consulting teams were seen as experts on social sector issues, analyzing data, building strategic frameworks, and recommending final solutions. While this approach worked well for certain projects, it failed to include the client in making sense of the data or in crafting the answer. What’s more, it assumed that the problem statement was fixed; there was room for iteration on potential solutions but not the initial problem itself. Impact labs addressed these limitations head-on by bringing together multiple stakeholders for the full design process. Through a co-creative approach, clients could share knowledge, offer diverse perspectives, process information quickly, and feel greater ownership over solutions. I noted that labs were most effective when clients needed to be involved in crafting solutions. A lab could be the primary reason for a client engagement, or a smaller component of a larger case. Labs could be used to kick off work, wrap up work, push deeper thinking in the middle of a process, or encompass the entire solution process itself. Given this variety of use cases, it was difficult to establish a set timeline, team structure, or cost base for an impact lab. Rather, I advised Bridgespan teams to consider a series of questions around goals, client needs, and resources before deciding on a specific lab approach. For the next part of this initiative, I summarized the key lessons learned through Bridgespan’s early experiments with impact labs. This included what worked and what didn’t, how to structure co-creative processes, and tips for first-time lab facilitators. I compiled a list of all relevant cases, including those that used a piece of the methodology and those that conducted full-scale labs, and reached out to team leads to get detailed information on successes and challenges. Additionally, I gathered a vast array of documents and resources, and organized them into categories, such as agendas, readings, assignments, space layouts, client reactions, and photos. I then created an “experiments in meeting design” collaboration space on Bridgespan’s internal knowledge wiki, and posted a set of tools for meeting designers and facilitators. I also developed a “knowledge capture process” for all teams engaging in this type of experiment so we could gather insights in a systematic way. Posting online would not be enough to convince individuals to undertake this work or teach them how to do it, so I spent time with my co-lead providing direct support to partners and managers experimenting with impact labs. We focused on internal projects as well as client-funded labs, acting as consultants to teams across Bridgespan’s three offices. One of our most critical projects was designing and facilitating Bridgespan’s partner retreat. We saw this as an opportunity to introduce some of the main components of the lab approach to Bridgespan’s key decision makers. We outlined a multi-day agenda with brainstorming sessions and mixed formats, had participants create lo-fi prototypes by sketching out concepts and actions in a visual way, and helped the group identify next steps for testing solutions to strengthen the consulting practice. Not only did this approach make the retreat particularly productive, but the partners left with a new perspective on the value of a more engaged, co-creative process. They reported that the discussions at the retreat felt more fun, dynamic, and inspired than usual, energizing them to try new ideas. Over two years, Bridgespan developed its internal capacity to design and facilitate impact labs in a relatively ad hoc way. 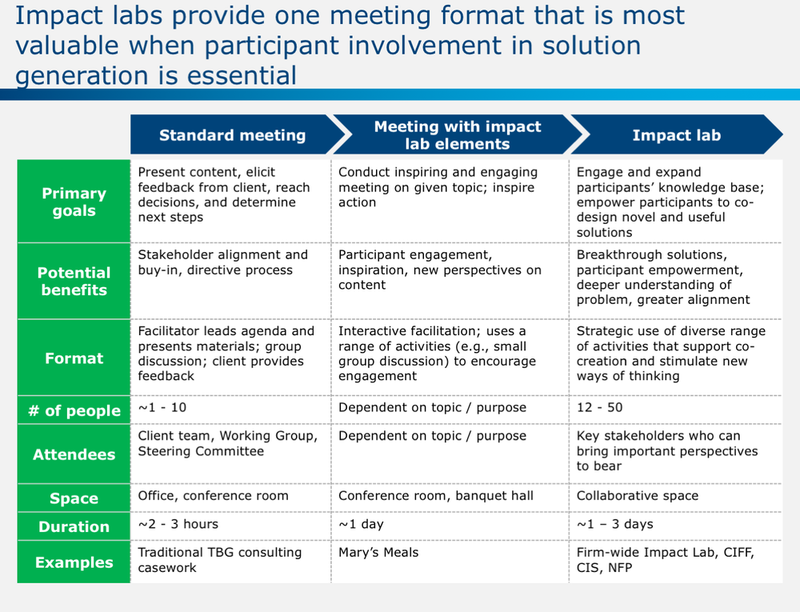 Most teams and individuals that decided to incorporate an impact lab into their approach asked for just-in-time support on agenda development and facilitation. There was little attention to staffing teams based on interest and expertise in carrying out the approach, in part because labs were sometimes added to project scopes as an afterthought after the work had already launched. Because adapting Bridgespan’s approach toward impact labs would require a new skill set and experiential training, my co-lead and I decided to launch an internal learning group. This would enable us to develop a cadre of people within Bridgespan with a strong interest, skill, and orientation towards the lab approach. We drafted a learning agenda, identified a cohort of 15 individuals, and kicked off the group with an exploratory session. Together, we identified key barriers we might face in building this capability, discussed the essential qualities of an impact lab, and identified opportunities to build our skills. Moving forward, we decided that our shared goal was to design a process for “learning by doing,” providing the foundational experiences and knowledge needed to become internal experts. Over the course of building out this new practice area for Bridgespan, my role evolved from internal champion to service-model strategist to lead designer and facilitator of client labs. In my role as designer and facilitator, I led teams through the process of understanding our client: Who are we designing for? What are their pain points? What do they aspire to create? I workshopped high-level creative concepts for our labs, ensuring that we had the right approach and narrative to elicit the best thinking from participants. I focused on group dynamics, sketching out potential participant personas so that we could anticipate how groups might interact and structure small groups in the most productive way. I led the creation of highly structured agendas, with minute-by-minute instructions that would feel organic and effortless. And I led our work around space design, ensuring we had the right environment, layout, visual aids, food, and other essentials to inspire collaboration. College Access Foundation of California (CAFC): Over a series of months, Bridgespan worked with CAFC (rebranded as the College Futures Foundation) to design and facilitate an impact lab on expanding access to financial aid. Our lab created the space and structure for CAFC grantees to interact, learn, and explore innovative models, all with an eye toward launching successful campaigns. For this project I acted as a lead lab designer and facilitator. I led a full design-thinking workshop, which involved ideation, solution selection, and prototyping via structural models, skits, ad campaigns, and other visual presentations. These methods proved to inspire new ideas and encourage future collaboration among grantees. Donors Forum: More often than not, nonprofit funders won’t provide resources to cover “overhead” — salaries, rents, and operating costs. However, without these things, nonprofits can’t grow or retain staff, which affects their ability to achieve impact. Working with Donors Forum (rebranded as Forefront), a membership organization for philanthropies, Bridgespan invited 22 national leaders from the nonprofit, philanthropy, and government sectors for a two-day impact lab on overhead. As a lead lab designer on this project, I thought carefully about designing activities to stimulate the best thinking. For example, we presented artifacts — interesting articles, beneficiary quotes, visual diagrams, sector data, and more — and asked attendees to view these materials as an anthropologist piecing together the story of nonprofits in the 2000s. We developed high-level personas, such as “the struggling nonprofit” or the “government grant reviewer,” to help the group identify challenging behaviors and paths for change. And we began work on developing a new narrative about costs, orienting all of our exercises toward action. Democracy Colaboratory: Bridgespan led a three-day lab for members of the Hewlett Foundation’s Madison Initiative. This group included 80 government leaders, nonprofit advocates, academic researchers, and funders. The purpose of this lab was to explore and make sense of the current state of our representative democracy, enabling leaders to connect with one another, examine democracy from a range of perspectives, develop new ideas, and seed future collaborations. As a lead designer and facilitator, I worked with our broader team to develop a high-impact, diverse, minute-by-minute agenda. Activities included breakout groups; brainstorming exercises; prototyping solutions using collages, diagrams, skits, and other visual presentations; testing and improving those prototypes; and guiding the group to several “big ideas” that all lab participants agreed on. This work pushed Bridgespan to take a hard look at its consulting model, expanded the organization’s understanding of client engagement, and opened the door for case teams to explore more collaborative, co-creative processes. Since this work began at Bridgespan, the organization has continued to develop its impact lab practice, learning from experience and refining its approach to encourage innovation.